J Crew is getting $140 for a Bass tassel loafer made in El Salvador. 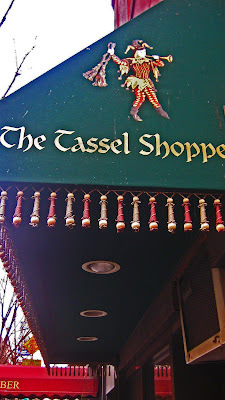 I recently saw them in their Columbus Circle store and let loose with a snort of superiority. I found these for $35 on EBay. I have no idea who Mellace's was or is but this is what you can do with a little homework and incentive. 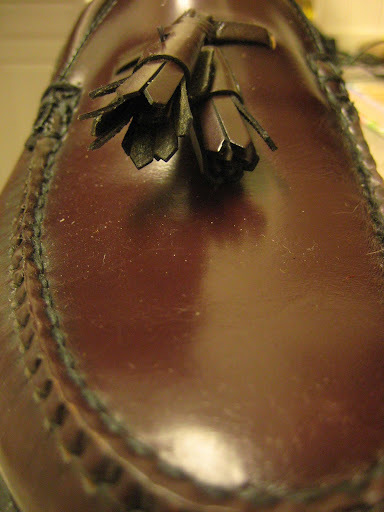 I remember Sebago as a cheaper alternative to the Bass tassel in the 80's - which is why I had a pair (shown here). The profile is slim unlike a better made but bulkier Alden Cape Cod ($240) and that cordovan color is what I really remember. Perfect with high water chinos and white socks. 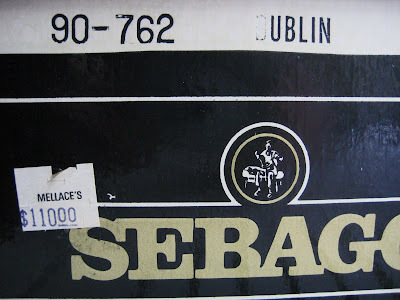 I'm pretty sure I was wearing Sebagos when ME threw my car and dorm room keys down a sewer grate on our way home from Dan Jans one foggy night back in '83. But you probably don't know what I'm talking about. Can't wait to hear the story! I love Sebagos! I have two pair and I think they are superior to all the loafers I have had before. I admit I have never had Aldens though. 27 years is not 30 years. Time to round down not up. Kathy- Oh yes you can. 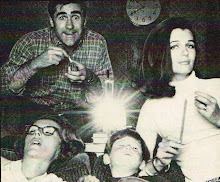 M Lane- I like the Cape Cod Aldens. I think they make 'em in the old Maine factory Cole Haan had. DW- You mean a Baptist terrorist? ME- Ganging up on me? I just got a pair of Sebagos on ebay! Shiny new cordovan colored ones! I can't wait to get them. Snort away because you got a steal, even by 1983 price standards. I had a pair of dark blue Sebago moccasins back in 1983. They had fringe, and red and white beads. Preppy, but funky. And - I swear I'm not making this up - in 1983, I had a pair of Bass shoes that were styled like cheerleader shoes, not saddlebacks, more like flats. Think of the shoes the Peanuts characters wear and you've got it. Mine were white with dark blue stripes, but Bass also made them with gray, teal, red, and black stripes. Everyone in my gurl gang had these shoes. Thinking back, these were kind of like the Snuggie of their day, for girls anyway. I'm not finding pics of either of these. I will probably have to dig up a 'Seventeen' magazine to see these shoes again. 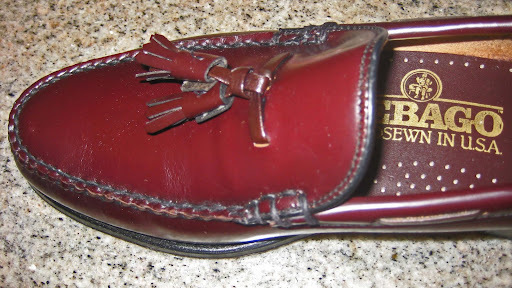 Right around Christmas I won a pair of Sebago penny loafers on eBay for $30. 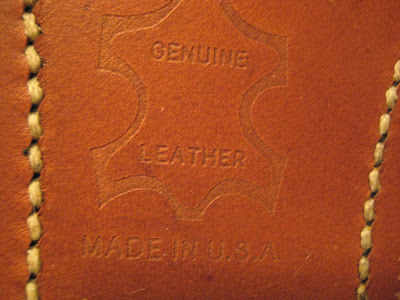 Same color, also US made. Seller said in the listing that her father had received them as a gift but hated loafers so they were never worn. So, my thanks to the loafer-hating dad.